The Kenwood House is a spacious yet cozy turn of the century, wine country cottage located on the Kenwood Plaza in Kenwood, California. We are located in the heart of Sonoma Valley, the famous Valley of the Moon. The Kenwood House, a luxury vacation rental, has been offering wine country lodging since 1998. Next door is the charming and historic Kenwood Community Church. The views from the front porch look onto the Kenwood plaza, a quiet, beautiful park. A seasonal creek flows next to the house through the gardens and into the plaza. Accommodations at the Kenwood House include two deluxe bedrooms with feather beds, down comforters and luxurious linens. The Living room has a brand new comfortable queen sleeper sofa .There are 1-1/2 baths and it includes a 6 person therapeutic spa (HOT TUB), spacious redwood decks, FIRE PIT!, gas BBQl, enchanting gardens, stone fireplace, central heating, free wireless internet, 60" flat screen TV, beautiful fully equipped sunny kitchen, washer and dryer. The base rate for the house is for up to 4 guests. Two additional guests can be accommodated for an additional nightly rate of $30.00 per guest per night. The house is approximately 1/4 mile from Hwy. 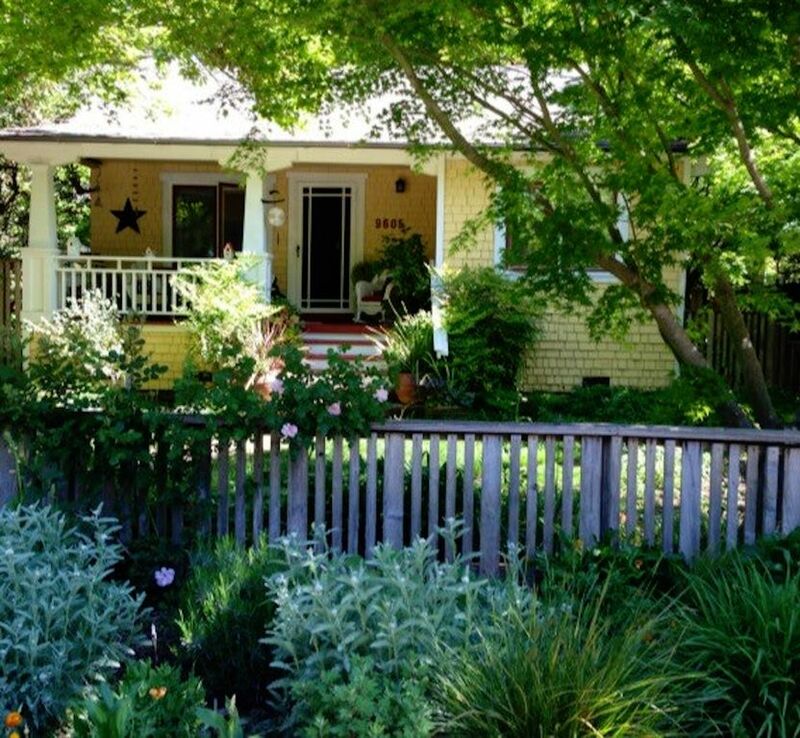 12 and is the perfect location for exploring the wine country of Sonoma and Napa valleys. Within easy walking distance are the Kenwood Winery, Kunde Winery and VJB. Also walking distance are two excellent restaurants with many more in Glen Ellen, Sonoma or Napa. Within a 5 mile radius are 3 state parks offering many possibilities for outdoor recreation including biking, picnicking, hiking and swimming. Sugarloaf Ridge State Park offers excellent hiking as well as the Robert Ferguson Observatory, for a look at the night sky. Annadel State Park offers world class mountain biking, hiking and horseback riding. For a taste of history, literature, hiking or a leisurely walk, Jack London State Park is incomparable and uniquely Sonoma Valley. Kenwood is located in the center of the wine country with hundreds of Sonoma and Napa Valley wineries within easy driving distance. Spa facilities are available nearby at the Kenwood Inn and other local day spas. For shopping, restaurants, history and more wine tasting, the town of Sonoma is only a short drive away. Amy, a retired office manager and Don, a local landscape architect are long time residents of Sonoma County. The Kenwood House was purchased in 1971 by Don’s mom where he has lived off and on for 45 years. Amy moved to Santa Rosa as a little girl with her family in 1962. We met in 1994 and were married in 1998. We raised our blended family in Santa Rosa. During this time, the Kenwood House was established as one of the original vacation rentals in the Kenwood area. We ran this business continuously for 13 years providing a unique visitor experience and a high level of hospitality. In 2010 we decided to move to the Kenwood House to enjoy this special place ourselves. Now with an expanding extended family, we have moved on. Once again the Kenwood House is available for guests to enjoy during their visit to Sonoma County. When we began this venture, one of our goals was to offer visitors from around the world a unique place to stay while experiencing and enjoying wine country in Kenwood, the heart of Sonoma Valley. It gives up great pleasure to share our home and offer the opportunity for our guests to make their own memories of their stay here. toilet, tub, shower, Beautiful restored clawfoot tub...very romantic! High speed Internet access is provided via wireless internet. Oakmont Golf Course is nearby. The house is slightly above grade and includes a total of 7 steps between the front entry and the the living room. We stayed at Kenwood House for our annual girls weekend and it was wonderful. The house is very tastefully decorated and has all the amenities you need. The back yard offers a beautiful spot for a relaxing visit. Don and Amy are very thoughtful hosts and finally, the location is perfect. I would highly recommend the Kenwood House! Perfect location for a relaxing getaway! What a great rental! This house was the ideal retreat to relax and explore wine country. After a fun day exploring, coming back and relaxing by the fire or in the hot tub, it was a great way to end the day. Lots of fantastic local eats and a nice little grocery store with anything you'd need and plenty of prepared food if you don't want to cook in Glen Allen nearby. The house was comfortable, quiet, clean and homey, and Amy and Don were very attentive to any needs we had. Overall, a we loved our stay and wouldn't hesitate to stay there again. Thanks Don and Amy! We are thrilled you had such a wonderful time at the Kenwood House and enjoyed all that it has to offer! Thank you so much for all the compliments. It gives us great pleasure when our guests are so happy comfortable and relaxed in our home!! We hope to host you again! Really enjoyed this property - in great shape, and awesome amenities! No worries or issues for our family's stay over Christmas. Communications from Don was timely and only as needed. The house was ready as promised, heat was on and there were some fun amenities left behind for our enjoyment during the stay. We had some elderly visitors and this home was ready for them with sturdy handrails and an open and flat floor plan for their easy navigation. That was very much appreciated and appeared to be a recent modification. Thanks Don! This is truly a home that is loved and well taken care of. The furnishings are comfortable and fit the style of the house perfectly. Should our need arise again we will again utilize this house. I also recommend it highly as an option for anyone else's consideration. Four 1/5 Stars! Great small bungalow with magical gardens. Loved the stay and hosts anticipated every need. Really enjoyed our stay! PROS: Great decor, super comfortable, close to a small grocery store, well-appointed kitchen, across from a park, FANTASTIC backyard with hot tub and lovely fire pit. Adorable house and good location! Such an amazing stay! I honestly can’t say enough good things about it. I came to the Sonoma area for a girls trip and this house was perfect. There was 4 girls and the space was great. The back yard is so charming and so is the whole house. Don and Amy were really good at sending places to eat at and helping out with what to do in the area. And not to mention they had music playing for when we came in. It’s the little things. Such nice people and such a great house. Close to Sonoma and so mandy wineries too. For the security of our guests, a "Ring Doorbell" is installed at the front door to the house. This device includes a camera that records video and audio of the front door and porch only.